When he’s not protecting Joe Flacco, the 23-year-old Urschel enjoys digging into extremely complicated mathematical models. “We are working on evaluating possible exposures and doing testing at the Maryland state public health laboratory to attempt to identify an agent,” officials said in a letter to attendees. The conference, held April 8 to 10 at the Baltimore Convention Center, attracted at least 1,300 of the top food safety officials in the nation, including staff from federal agencies such as the Food and Drug Administration and the Centers for Disease Control and Prevention as well as businesses such as McDonald’s, Tyson and ConAgra Foods. Health officials have heard back from about 400 of those who attended, so the actual toll of illness might be higher. City health officials inspected the convention center and its food service provider, Centerplate. The company was issued a violation notice for condensation dripping from one of the two ice machines in the kitchen, a spokesman said. YouTube user ToddTesla posted the 90-second clip, which consists mostly of residents reacting to cars that appear to be tipping into a crevice at the edge of 26th St. in the city’s Charles Village neighborhood. At the 1:12 mark, one of them notices that the road is splitting apart, and then the street’s entire retaining wall gives way in a deafening crash as the bystanders scream in disbelief. No one was injured. Heavy rains in the Baltimore area on Wednesday caused widespread flooding, which led to the collapse. CBS Baltimore reported that Charles Village residents had also made numerous complaints about the “crumbling” street over the past year. A napkin-size Renoir painting bought for $7 at a flea market but valued at up to $100,000 must be returned to the museum it was stolen from in 1951, a federal judge ordered on Friday. The 1879 Impressionist painting “Paysage Bords de Seine,” dashed off for his mistress by Pierre-Auguste Renoir at a riverside restaurant, has been at the center of a legal tug-of-war between Marcia “Martha” Fuqua, a former physical education teacher from Lovettsville, Virginia, and the Baltimore Museum of Art in Maryland. Judge Leonie Brinkema, in a hearing in the U.S. District Court for the Eastern District of Virginia, dismissed Fuqua’s claim of ownership, noting that a property title cannot be transferred if it resulted from a theft. “The museum has put forth an extensive amount of documentary evidence that the painting was stolen,” Brinkema said, citing a 1951 police report and museum records. “All the evidence is on the Baltimore museum’s side. You still have no evidence – no evidence – that this wasn’t stolen,” said Brinkema to Fuqua’s attorney before ruling in favor of the museum. Fuqua bought the unsigned “Paysage Bords de Seine,” or “Landscape on the Banks of the Seine,” at a Harpers Ferry, West Virginia, flea market in late 2009 because she liked the frame, she said in a court filing. She paid $7 for the painting, along with a box of trinkets. Although the frame carried the nameplate “Renoir 1841-1919,” Fuqua was unaware the 5-1/2-by-9-inch oil painting was genuine and stored it in a garbage bag for 2-1/2 years, she said. Her mother, an art teacher and painter, urged her in July 2012 to get the painting appraised. Fuqua took it to the Potomack Co, an Alexandria, Virginia, auction house, which verified it was as an authentic Renoir. After media reports about the painting, the Baltimore Museum of Art said in September 2012 it had been stolen while on loan to it. The Federal Bureau of Investigation then took custody of it. What happened to the painting in the time after the theft in November 1951 and the time it surfaced at a flea market is not known. Fuqua had contended that “Paysage Bords de Seine” should be returned to her since she was unaware of it having been stolen or of it being genuine. The Potomack Co had estimated the painting’s value at $75,000 to $100,000, but an appraisal done for the FBI said it was worth about $22,000. The painting is soiled and “there is a distinct lack of enthusiasm for paintings by Renoir now considered a more old-fashioned taste,” appraiser Ted Cooper said, quoting an art market report. Renoir painted the work for his mistress on a linen napkin, while at a restaurant near the Seine River, Cooper said, quoting museum curatorial notes. Questions about its ownership also have diminished the painting’s value, said the appraisal, which is part of court filings. “Paysage Bords de Seine” came to the Baltimore museum through one of its leading benefactors, collector Saidie May. Her family bought the painting from the Bernheim-Jeune gallery in Paris in 1926 and May lent it, along with other works, to the museum in 1937. May died in May 1951 and the collection was willed to the museum. As its ownership was going through legal transfer, the painting was stolen while still listed as being on loan. 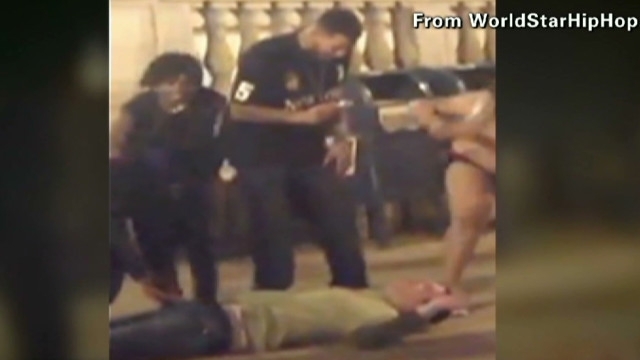 Onlookers laughed and did nothing to help as a man was beaten, stripped and robbed on the street in Baltimore. The attack, which police say happened on March 18 after St. Patrick’s Day celebrations, was captured by at least two cameras. Video of it went viral. “Not only did they rob him, but they attempted to strip him of his dignity. They tore his clothes off; they mocked him. That behavior just will not be tolerated,” said Detective Nicole Monroe with the Baltimore police. Police say they have identified one suspect, but have made no arrests. They are not releasing the victim’s identity except to say he was a 31-year-old man from Arlington, Virginia. The victim was on the way to his hotel from a downtown Baltimore club when he was attacked, according to a police report. The man had been drinking. He told police he couldn’t recall exactly what happened, but the videos fill in the blanks. In them, a man is seen standing, unsteadily, against a row of mailboxes. A crowd starts to gather and women dance suggestively against him. Someone notices his watch and a hand seems to grab something from one of the man’s front pockets. He pursues the supposed thief and is punched in the face. The man falls over backward and his head hits the sidewalk so hard it can be heard on the video. His pockets are rifled and his clothes pulled off. Some people can be heard laughing. No one comes to his aid. According to the police report, the man lost his Tag Heuer watch, which he valued at $1,300, his iPhone and car key. CNN showed video of the attack to a number of people in Baltimore to gauge their response.